I have entered another challenge over at Cardz TV. 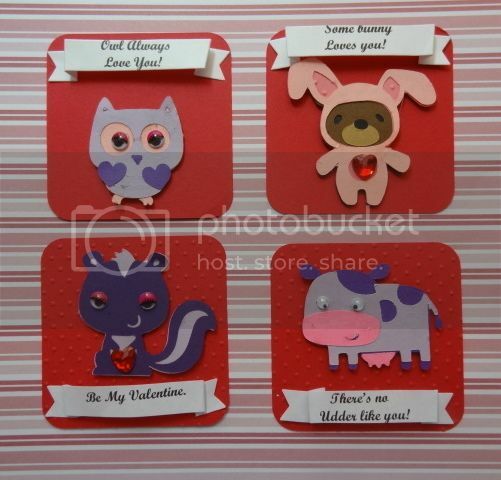 You are to make 3 kids cards cut at 3". I had so much fun I made a a skunk that came out so "stinking cute" LOL. I used the cricut cartridges Birthday Bash for the square card which is really listed as a tag. I used Create a Critter 1 for the cow and the skunk. I used Bears on Parade for the Bunny and Create a Critter 2 for the owl. I used a banner die from Simon Sez for the sentiments which I typed and printed from the computer. I'm going to mail these out to my granddaughter tomorrow. Comments are always welcome. Thanks for stopping by. Lovely cardz, gr8t job, thanks for joining CTVS!